Queen Merelda is a supporting character in the game Wario Land: Shake It! She is the queen of the Shake Dimension. Merelda and her loyal subjects, the Merfles, were imprisoned by the evil Shake King and his pirate gang (who attempted to take over the locale and also stole the Shake Dimension's treasure, the Bottomless Coin Sack). However, one of Merelda's Merfles managed to escape into Wario's world requesting help to rescue the Shake Dimension from the Shake King's evil grip, as well as rescue Merelda herself. After Wario rescues her, she walks up to him to thank him for his actions and how they brought peace back to the Shake Dimension; however, Wario grabs her and throws her aside as he only cares about the Bottomless Coin Sack. Queen Merelda's name is a pun on the Spanish or Portuguese word esmeralda which means "emerald", a green colored gem. 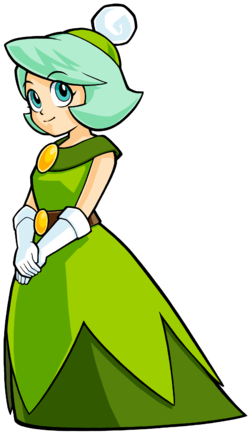 Her name is also an anagram of "emerald." German Königin Midori midori is Japanese for "green"; Königin means "queen"
This page was last edited on February 11, 2019, at 03:35.